Mary Abbe, secretary at Woodbury Elementary School who is in her 42nd year, was honored by Woodbury Principal Anel Garza at the start of the meeting. Woodbury Elementary School Principal Anel Garza, left, honors secretary Mary Abbe during the Oct. 19 board meeting. Mary received a standing ovation from the board and guests at the meeting. She said she loves the staff, which is why she has stayed at the school. Several members of the Woodbury staff were at the meeting to show their support. Lucas Johnson, Marshalltown High School boys’ golf coach and Miller Middle School teacher shared his video of the golf team. Johnson thanked the local golf courses for their support of the team and said the team had a great season. To view the video Johnson produced, click here. Arlene McAtee gave an update on the work the committee has been doing. She said the committee is looking at a different type of break schedule which would include more frequents breaks of length and a shorter summer break to help cut back on summer learning loss. There are 24 members of the committee who meet monthly. The members include parents, representatives from community groups, teachers, school board members and administrators in the school district. The next step the committee will take is to interview 10 districts across the country which have been successful in implementing a continuous learning calendar. The board confirmed they want the committee to continue its work and come back to the board for a recommendation in March 2016. Board President Bea Niblock asked them to also interview those districts that were not successful with this continuous calendar implementation. President Niblock said many community members would like to have public forums on this topic as well. New board members Ben Stansberry and Ross Harris would like to serve on the committee and board member Kendall Derby will remain on the committee as well. Matt Cretsinger, director of special services with the district, gave an update on Medicaid reimbursements. Cretsinger talked about the claiming process and who is eligible to receive Medicaid. “We continue to show an increase in reimbursements over the years,” he said. Mary Jane Vens, of the Iowa Association of School Boards, talked to the board about what IASB does and how it can assist board members. Vens had the board members write down what their greatest accomplishment would be 8 years from now and two hallmarks of this board. Most board members talked about the goal of increasing student achievement. Dr. Susan Pecinovsky, associate superintendent, updated the board on what supplemental services are available to elementary students and how they qualify for these services. This was an information item only. Lisa Koester, director of human resources, presented educational data available to board members, which is quite extensive. She focused on how to navigate certain websites. One site being the Iowa Department of Education website, where anyone can access the public reporting website for testing data, demographics, enrollment, financial information and more. The second website she focused on was the district website and how to access board policies. The third website she displayed was the Iowa Association of School Boards site. Andrew Potter, communications director, presented the annual report to the community, which is part of the Fall newsletter. It will be printed and distributed later this week at the schools and several community locations including the Fisher Community Center, Marshalltown Public Library and Albion Public Library. The report will also be available on the MCSD website. Rick Simpson, director of Buildings and Grounds and Dave Schulze, district architect with TSP, presented to the board on the demolition of homes in the Rogers Elementary School area and also the demolition of the former district office. Simpson said this has made the Rogers site safer and opens it up for future school projects. For photos of before and after work on the projects, click here. The board accepted the projects as substantially complete. This project included restroom remodeling and addressing accessibility issues. The board approved the project as substantially complete. A discussion was held regarding the audio/visual presentation of the board room. Schulze and Simpson spoke to the board on this issue to attempt to fix some problems in the board room regarding sound and display of items being discussed. Schulze said the proposed cost of the improvements is estimated at $20,000.This was a non-action item with a formal proposal planned to come before the board in November. 603.12 R- Electronic Resources and Electronic Mail Appropriate Use Regulation – Marked with a review date. 310.4 –MCSD Organizational chart– The current district chart was passed out to the board. 802.7-R – Energy Conservation Guidelines– Central office staff to prepare draft on this and will be brought back to the board. “The board had the opportunity to have Mary Jane Vens, Board Development Director for the Iowa Association of School Boards (IASB) make a presentation to them during the board meeting. During this presentation she explored the board’s direction, goals and teamwork. Ms. Vens gave the board her insight and provided us with suggestions for working together for the common good of the students in the district. 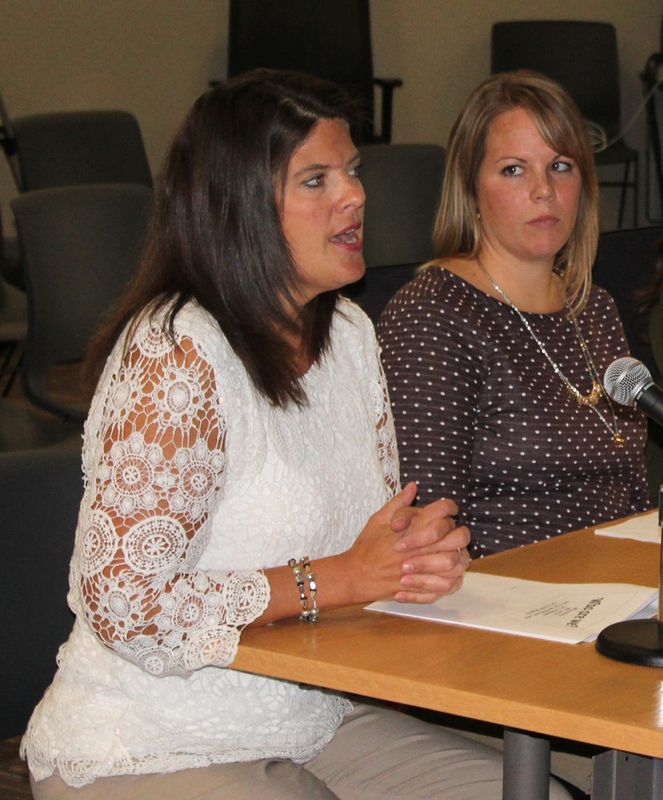 Hoglan Elementary Principal Amy Wiliams, left, and teacher Lindsay Stanton present to the school board on Oct. 5. Hoglan Elementary School Principal Amy Williams and teacher Lindsay Stanton talked about the Hoglan Garden. Every student in the school was part of the planting project last school year. Many students helped water and care for the garden over the summer and were able to take home some of the food. “We will look to expand the garden next year,” Stanton said. Marshalltown High School art teacher Kirk Niehouse was given approval by the board for an art trip to Chicago planned for Oct. 24. 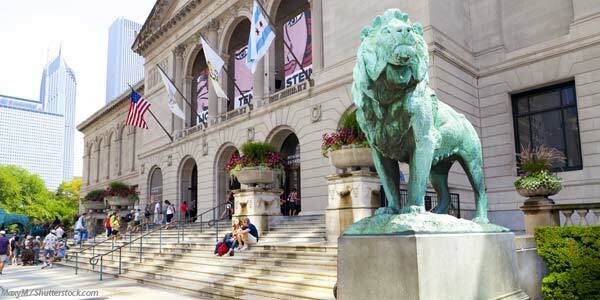 The one-day bus trip will take students and chaperones to the National Museum of Mexican Art and the Art Institute of Chicago. The students will also visit “The Bean” at Millennium Park and have dinner at Navy Pier while in Chicago. All out-of-state school trips must be approved by the board. Hoglan Principal Amy Williams presented the annual report to the board along with Hoglan staff Deb Moore, Lacie Moore, Lindsay Stanton and Sara Nichols. Hoglan serves 369 students with 45 percent being English Language Learners. Hoglan has had an influx of Southeast Asian students in recent years and has a bilingual language assistant this year to help serve many of these students and families. Hoglan staff talked about several initiatives at the school including Sheltered Instruction Observation Protocol (SIOP), Language Literacy Framework and more. They also talked about several ideas used to increase parent involvement. The presentation also featured video clips from students and staff at Hoglan. Lisa Koester, Director of Human Resources, explained that the official student enrollment count has yet to be determined. The numbers are still in transition between districts as reconciling needs to be done between districts. Bobby Shomo from Shomo-Madsen Insurance (EMC) presented a dividend check to the Marshalltown Community School District for $52,281. “The school has done a really good job with our safety program,” Shomo said. Matt Cretsinger, Director of Special Services, talked about the current special education deficit of $1.37 million. He said schools have to recover over-expenditures due to lack of state and federal funding for special education students. This is typical of many school districts in the state. The board approved to seek authority from the School Budget Review Committee for additional spending authority. Brian Bartz, Director of Business Operations, talked to the board about this process. He described how the district is funded on a per student basis. He also gave the board a brief overview on how the budget is built. Superintendent Dr. Marvin Wade said building the budget is a year-long process and the board will receive updates on the process periodically. 603.12 E1 – Internet Access/Permission Letter to Parents or Guardians- deleting this policy – No longer need this form as it is in handbooks and at registration. 603.12-R – Internet and Electronic Mail – Appropriate Use Regulation – Changes to be made, will be brought back for first reading. 701 – Financial Accounting System – Marked as reviewed. Committees – Board members were asked to send Board President Bea Niblock the top 5-6 choices for committees to serve on. Board members should plan to be on at least 3 committees. Niblock said at the end of the each meeting she would like board members to talk about the difference being made in the lives of kids at each meeting. Board Vice President Janelle Carter mentioned the Hoglan Garden and art trip as examples of those differences made. For a list of personnel items, click here. “September’s election has put a far different group of people around the board table. The October 5th meeting was the first meeting that all of these people gathered to blend their abilities. To this new board, let me say that I am excited to see how we can make a difference in the lives of teachers and students. To those past board members who no longer occupy seats at the table, let me thank you for your many years of service to this school district. Those members gave many hours of time and effort and shared their abilities with all of us in their service.